A card for Mojo Monday281 and for the color challenge at Splitcoast, using SU! Certainly Celery, Chocolate Chip and Crumb Cake. I substituted Early Espresso for the Chocolate Chip. And for dessert our hostess asked us to use dry embossing. Actually a very quick and simple design. 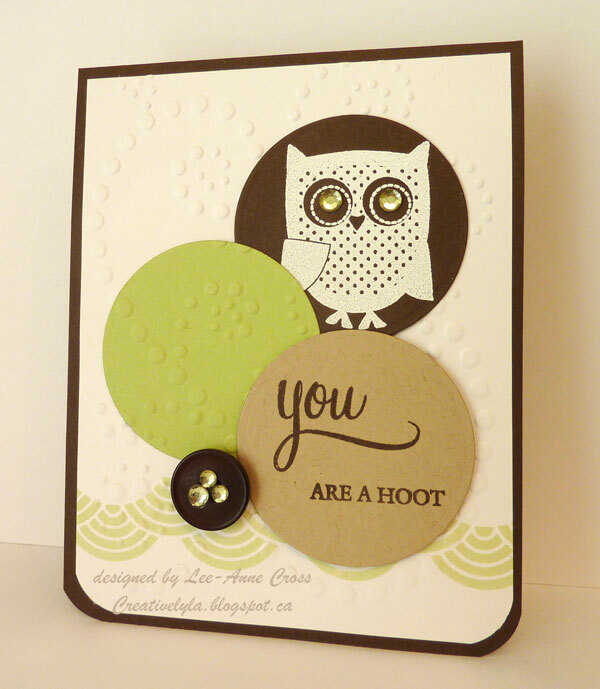 I used my Spellbinder’s circle die to cut circles in the three colors. The little owl was heat embossed with white embossing powder and has a couple of little rhinestones to add some bling. And the Certainly Celery circle has been embossed with the same embossing folder as used in the background. Then the sentiment circle was simply stamped in Early Espresso. A fun little border from Avery Elle was used before the background was dry embossed. This is sooo cute! Love the little owl!